Overcome evil with good, falsehood with truth, and hatred with love." From 1953 until 1981, a silver haired woman calling herself only "Peace Pilgrim" walked more than 25,000 miles on a personal pilgrimage for peace. Wearing a blue tunic and carrying just a few worldly possessions in her pockets, she shared her simple but profound message in thousands of communities throughout the U.S.: “when enough of us find inner peace, our institutions will become peaceful and there will be no more occasion for war.” Today, her words – captured in books, videos and other media – continue to inspire people around the world. Latest Peace News: Cherry blossoms were in full bloom in Washington, DC as Peace Pilgrim was among 12 extraordinary people honored as “Visionary Women: Champions of Peace and Nonviolence” by the National Women’s History Alliance. See photos and more in our latest blog. Born Mildred Lisette Norman on July 18, 1908, Peace Pilgrim grew up among a close-knit extended family on a poultry farm in Egg Harbor City, NJ. After enjoying the "flapper" era as a young woman, her inner compass slowly moved toward seeking a greater purpose. Following an unhappy marriage, she embarked on a personal transition that culminated with her hiking the 2050-mile Appalachian Trail – the first woman to do so in one season. On this journey, she had a vision that guided the rest of her life. Relinquishing her name and possessions, she stepped out in front of the Rose Bowl Parade in Pasadena, CA on Jan. 1, 1953 wearing a blue tunic imprinted with her new identity: PEACE PILGRIM. For the next 28 years, she criss-crossed North America, touching many thousands of hearts, minds and lives as she walked joyfully on her pilgrimage for peace. Following Peace Pilgrim's untimely death in 1981, a number of friends she met from all over the country came to New Mexico to honor and share memories of the amazing woman who changed their lives. This gathering gave birth to the classic book Peace Pilgrim: her life and work in her own words and also spawned a volunteer organization, Friends of Peace Pilgrim. Run by a dedicated board of directors and supported solely by donations, our mission is to preserve and spread the legacy of Peace Pilgrim. We do this by sharing her everyday wisdom and messages of peace through her writings, a biannual Friends of Peace Pilgrim Newsletter, special events and other outreach. 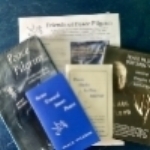 Along with the classic book, Peace Pilgrim: Her Life and Work in Her Own Words available in 16 languages (including English), Friends of Peace Pilgrim offers a wealth of print, audio and video compilations of her writings and teachings. Among the most popular, with more than two million copies distributed, is her booklet, Steps toward Inner Peace, which, in addition to English, has been translated into 30 other languages. In the spirit of Peace Pilgrim, these offerings are sent for free to all who ask. Many can also be downloaded.